If you’ve read this blog for more than three seconds, you probably have realized a couple of things: I like to share stories/videos/cool things and I like lists. On Thursday, I watched a little bit of the Reds and Brewers. I saw the end of the Padres and St. Louis. I’m looking forward to seeing what happens with the Twins during a pretty difficult road trip to star the season. Just as how I like to see cool golf courses, I like seeing other MLB stadiums. I’ve never gone on a guys week-long baseball trip, but I try to see baseball during my travels. That was especially the case when I used to travel a lot more. I went to the Braves season opener on the day of the national championship game when the Final Four was in Atlanta. My only trip to Shea Stadium came when I was in New York for the NBA Draft and it goes on from there. I have taken the tour of Fenway Park. I covered basketball at Tropicana Field. But neither of those count. I have seen most of the parks that I really want to see. I should say that I want to see a game at Fenway, but I just don’t get that excited about the Red Sox. I feel the same way about the Yankees and the new Yankee Stadium. The two that I’m probably most interested in seeing are Safeco Field in Seattle — which everyone says is the best retractable roof stadium — and Dodger Stadium. Safeco is supposed to be cool and is often mentioned by friends as their favorite. Dodger Stadium just seems so retro cool that it makes the list. Obviously I’ll be at Target Field a bunch between the upstairs 20-game package and working a little bit in the press box. There are plans for a summer trip that very well may include stops at Miller Park and Comerica Park. Neither would be new, but that isn’t the end of the world. I really enjoyed Comerica last time and I think it is underrated. That rating might have been influenced by the fact I was there on a lovely Sunday afternoon. So how many stadiums have you been to? 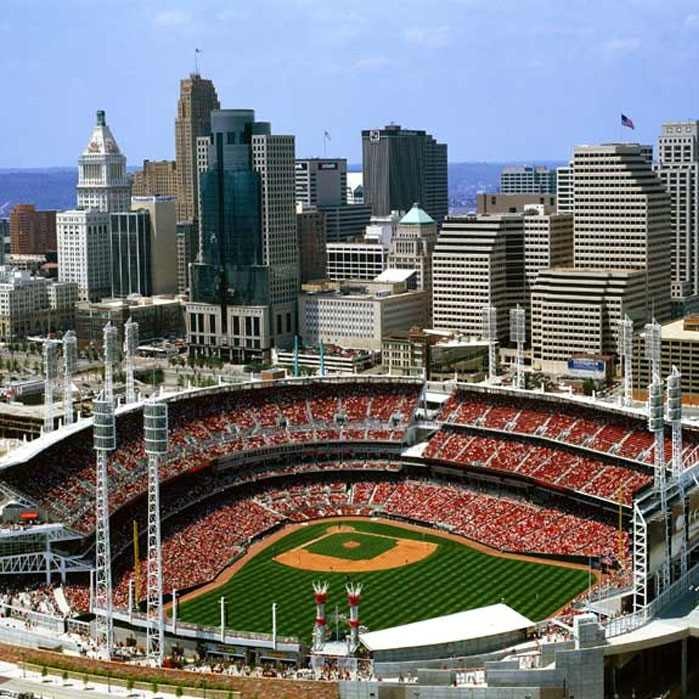 Any big plans for summer baseball road trips? If you don’t have the blog of Esquire writer Chris Jones, well, you should. The dude can write and and he understands what is interesting. His latest post talks about the inspiration he finds in the beginning of the baseball season. His theory is about how if you live to be 81 years old, an “inning” is nine years long. And with the beginning of the baseball season, it reminds him what else he wants to accomplish. The dangers of having two work sites. Or Jeff is a moron. As some of you know, I have multiple worksites for my job. Over the past couple of weeks, I’ve been almost exclusively at one location because of a specific project. But as a general rule, I spend Mondays, Wednesdays and Fridays in Bloomington and Tuesdays and Thursdays in St. Paul. So this morning, I had a 9 a.m. meeting. It was organized by one of my colleagues in St. Paul. The last meeting like this that we had was in St. Paul. As a result, I got up this morning and drove to St. Paul. I parked my car, walked to the office, but it was locked. I figured my colleagues were already down in the meeting room. I hung up my coat, pulled a couple of things out of my bag and pulled out my phone to figure out what room the meeting was in. I unlock my iPhone to see where the meeting is and guess what? Yep it was in Bloomington. Yeah, not the best start to my day. Yeah, I was late. Yeah, I felt/feel like an idiot. I admit that I am excited about the release of Tiger Woods 12. I preordered my copy and it should be at my house when I arrive home from work Tuesday night. I also think the folks at EA Sports have done a great job creating buzz for this game. Between Tiger Woods being on Jimmy Kimmel, constant video updates on Facebook and their site, Twitter driving traffic, media relations all over the place, the placement in the Best Buy weekly ad and the like. It has been a remarkable job. The idea of being able to play Augusta National Golf Club — one of the most exclusive clubs in the United States and the course that golfers watch year after year — will be an automatic hit for EA. I know people who aren’t as sick as me and don’t buy the new Tiger Woods game as soon as it is released who are fired up about this release. They are buying it for the first time in years. They are fired up. But don’t be surprised if you see a little complaining later this week. Because there’s a little something that seems to being lost in the excitement. That is that golfers aren’t going to be able to open the box, pop the disc in and suddenly tee it up at Augusta National. Like other Tiger Woods games, there’s much content that has to be earned. From what it seems, that will be the case with Augusta National. I’m excited about trying to build up my career and tee it up at Augusta National. But I’m guessing there will be a lot of more casual players aren’t going to be so excited. I love pizza. It is a fact that is undisputable. Like everyone, I like going to a place that makes a fantastic pizza. But I love pizza far more than that. I will order pizza at a bar. I will buy pizza at a sporting event. There are even plenty of frozen pizza options out there that are excellent. I’m not sure there is such a thing as bad pizza. OK, that might be going a little too far. 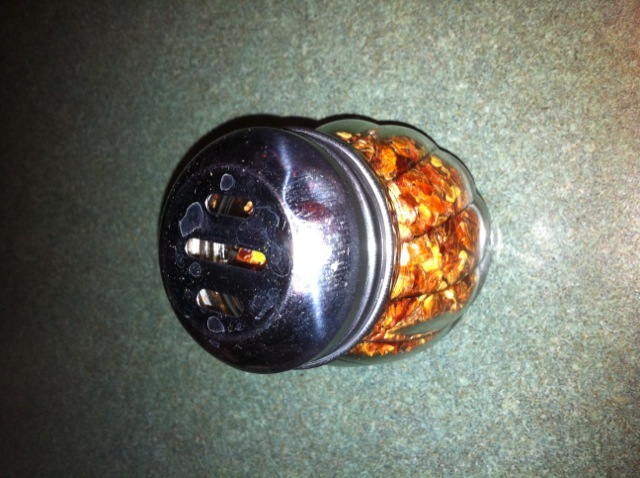 Take a close look at this small glass container filled with crushed red peppers. Do you see the slots on the top? That is what I am talking about. Nothing frustrates me more than a pizza place that puts the lid with the small holes in the shape of a star on the jar with the crushed red peppers. Why? Because you can’t get anything out of them. It’s great for parmesean cheese, but not for crushed red peppers. Yes, I realize that this is a completely ridiculous post. But it is my simple way to applaud those forward-thinking, pizza experts who realize that a customer who gets his or her crushed red peppers on their pizza is going to be a happy customer. How important is it for a reporter covering Major League Baseball to be able to speak Spanish? I’ve spent some time in baseball clubhouses. It is a place where about one in four players comes from somewhere outside of the United States. They are from Latin America, Asia and even places like Canada, Australia and the Netherlands. There are guys who are difficult for English-speaking Americans to communicate with. That’s the reality. Many of them learn English pretty well — Francisco Liriano was tough to communicate with as a rookie, but his English is pretty good now. So here’s the interesting story: Jerry Brewer from The Seattle Times is going to try to learn Spanish. His goal is to be able to conduct an interview by the end of this season in Spanish. It’s kind of a cool story. We’ll see if he can learn the language and if it helps him as a journalist.